Children from 125 schools across the South West on England are happier, healthier and more motivated to learn thanks to a new project commissioned by Natural England that has turned the outdoors into a classroom and helped schools transform ways of teaching. The findings have been released today by the Natural Connections Demonstration project, a four-year initiative to help school children – particularly those from disadvantaged areas – experience the benefits of the natural environment by empowering teachers to use the outdoors to support everyday learning. The project, which is funded by Natural England, the Department for the Environment, Food and Rural Affairs and Historic England and delivered by Plymouth University, is the largest project of its kind in England and has already helped more than 40,000 primary and secondary school pupils get out of their classrooms and into the outdoors – whether that’s a maths lesson in a local park or drama out on the school field. For the first time, the Natural Connections project provides strong evidence that learning outdoors has multiple benefits for school children. 92 per cent of teachers surveyed said that pupils were more engaged with learning when outdoors and 85 per cent saw a positive impact on their behaviour. The majority of children also thought they learned better and achieved more when learning outside. 92 per cent of pupils involved in the project said they enjoyed their lessons more when outdoors, with 90 per cent feeling happier and healthier as a result. The project has found taking lessons outside can also help motivate teachers, with 79 per cent reporting positive impacts on their teaching practice. Almost 70 per cent of teachers said that outdoor learning has had a positive impact on their job satisfaction and 72 per cent reported improved health and wellbeing. The Natural Connections project focused mainly on areas of deprivation in Plymouth, Torbay, Bristol, Cornwall and Somerset, working in both urban and rural schools with varying school grounds and access to local green spaces. These areas are now developing innovative ways to continue supporting outdoor learning across the school networks they have established through the project. 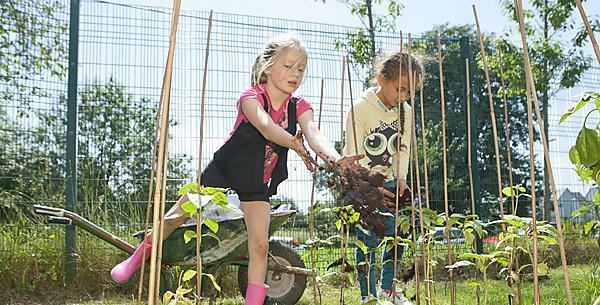 Natural England is now working with partners to help share the findings from this project to support and enhance the delivery of outdoor learning in schools across England. Natural Connections is a project funded by DEFRA, Natural England and English Heritage that aims to involve 200 schools in the South West with learning in natural environments (LINE). The project, led by Sue Waite and managed by Rowena Passy and Ian Blackwell, operates on a cascaded model of delivery, with five ‘hub leaders’ in Plymouth, Torbay, Cornwall, Bristol and North Somerset. Each hub recruits around five beacon schools, who then recruit around six ‘cluster’ schools, all of whom are in areas of high multiple deprivation. The objective is then to broker relationships between schools, support organisations and volunteers so that LINE becomes an established and embedded part of curriculum delivery. In 2013 Roger Cutting was part of a successful joint bid with Dr Dean Sherwin of the Wiltshire Wildlife Trust to the Blagrave Trust. The resulting award was £60,000 and this will be used to conduct a three-year longitudinal survey and evaluation of the use of ‘Forest Schools’ approaches with a cohort of children who have been identified with a range of social and behavioural problems. The project not only aims to evaluate the role that Forest Schools and outdoor education may play in providing different environments for children with behavioural problems, but also hopes to develop and trial innovative methods of such evaluations.